It is a pleasure to welcome two charming ladies of the Georgian world today. Sarah and Jo are your charming hostesses with a tale of espionage and betrayal. Madame Gilflurt, thank you kindly for inviting us to take a stroll around the Gardens with you. As we know all too well how much you enjoy the gossip of the day, we have a story for you that we feel sure you will not have heard about before, that of one of Napoleon’s highest ranking Generals - Jean Sarrazin. Many of your military friends will no doubt have heard about him – ‘intelligent and courageous but also conceited with an irascible temperament’ characteristics which as you will soon find out, resulted in his downfall. Born at St. Silvestre, Lot and Garonne, France on the 15th August 1770 Sarrazin rapidly climbed his way up through the ranks when, by the age of just 28 had reached the lofty height of General. A physical description of him at that time gave his statistics as being 5 feet 10 inches in height, brown hair, blue eyes and a robust physique. Anyway, we’re not here to discuss his military career, we will leave that to someone with far more knowledge on the subject. So, let us move swiftly on to the gossip and scandal, and well, this one is quite a story we hope you enjoy it! Whilst serving in Leghorn (Livorno) in Italy, a place occupied by the French army, Sarrazin was to meet a lady who would become wife number one - Cecilia Charlotte Schwartz, the daughter of a respected merchant of that city. The couple were married on the 4th June 1799 at Leghorn in Italy, although other sources say that it was year earlier, but whatever year it was it took the couple some five years to produce their first child, their one and only son and heir Frederic (born 24th February 1805). Oh and by the way we almost forgot to mention something of importance to Sarrazin; upon his marriage he received a not unsubstantial sum of money from Cecilia’s father to seal the marriage. At some point it seems that the marriage fell apart and the couple went their separate ways leaving Cecilia to raise Frederic alone. 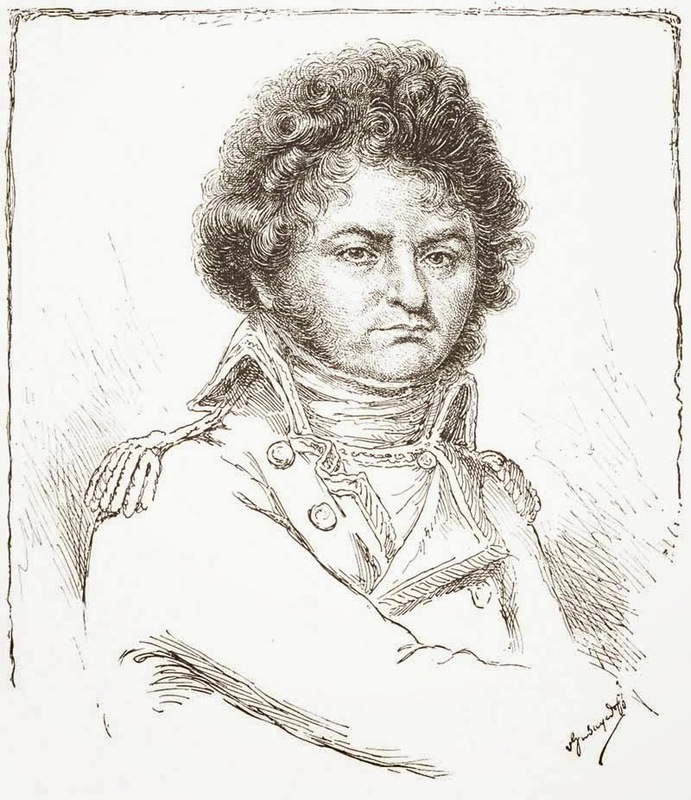 Sarrazin continued with his military career until one day whilst he was employed as an officer at Bologne he decided that he could stand the French army no longer and simply deserted and fled to England. There was much speculation that he was acting as a spy for the English, although nothing was actually proven at the time; however, he was regarded as being a traitor to France. We know from the Alien Register that he arrived in England in June 1810 and that he provided the English with information about Napoleon’s army. At the time of writing this he claimed that he only received £600 and that he was extremely unhappy. Virtually as soon as he arrived in England he began writing frequent letters to the Marquis of Wellesley hassling him for this money along with a passport to get him out of England, stressing in almost every letter that the money was not really for him, but was to support his wife and child, pointing out that his wife was born of English extraction, he also sought English citizenship on one occasion. His demands seemed to fall on deaf ears as no money was forthcoming. As his letters appeared to yield no result he had a change of heart and began correspondence with Buenos Aires with a view to leaving England for that place, this too yielded nothing, so he decided on a change of location and corresponded with an America official in the hope of seeking sanctuary in America. Yet again he had no joy! As we have said, according to Sarrazin his marriage to Cecilia had been dissolved, however in an account of his claims to the British government for money he wished for it to be recorded that his wife and son were to be denoted as ‘prisoners of war’. Whatever the truth of the situation, by 1813 he had met another young lady to whom he was married at St Anne’s Soho on the 26th May of 1813. The lady in question was a Georgiana Maria Hutchinson, twenty one years of age and daughter of Captain Samuel Hutchinson and his wife Albertine. In 1813 Captain Hutchinson was abroad, held as a prisoner of war and had been for some years. Sarrazin and Georgiana Maria were married by licence, with both declaring themselves to be unmarried, the marriage being witnessed by John Morgan, her sister, Amy Albertina & mother, Albertine Hutchinson. In order for Sarrazin to marry Georgiana he was presented with a difficulty that for anyone else may have been insurmountable, that of him being of the Catholic faith and Georgiana being of the Church of England. Sarrazin unlike many others had no difficulty in renouncing his Catholic faith; in fact it was something he did willingly as he thought that she had money and therefore worth it to secure her money. The couple obviously found a way of putting their differences aside and were reunited; however Sarrazin continued to behave in an appalling manner toward her, so much so that even the life of her unborn child was deemed to have been in danger. Despite this, on the 11th March 1814 Georgiana Maria gave birth to a daughter Frances Mary Emily Sarrazin; yet it was to be just shy of year years before she took Frances to be baptised (20th December 1815 at St Mary Newington); Sarrazin had left to return to France before his daughter was born, offering his services to Napoleon's military in spite of his desertion in 1810 but of course, given the manner of his departure it comes as no surprise to report that they were not interested. It soon came to light that Sarrazin was not actually free to have married in London and that his first wife Cecilia was still alive. Quite what happened within his personal life over the next few years seems unclear, but on the 14th May 1817 Sarrazin married for a third time, his third wife being Marie Delard the daughter of his neighbour. He was later to describe her in the most derogatory of terms ‘Miss Delard was ugly, lame and raised as a peasant’! A year later, despite his views of Miss Delard the couple produced a child, on the 17th June 1818, a daughter, Louise. In later life Sarrazin wrote his memoirs in which he recounted the story about his disastrous marriage to Marie Delard and said that one day she flew into a rage and left him, returning to her father’s house, which he said simply proved to him that he had made a mistake in marrying someone half his age, who he described as being uneducated. With this he decided to pack his bags and leave for Paris to claim his army pension, which he said if he did not receive then he would seek sanctuary in the United States of America, of course by this time he had clearly had enough of his perceived treatment by the English. The noted General Sarrazin, we informed by our Parisian correspondent, it is currently rumoured, had been committed to prison, on a charge of having married and deserted three wives. One of the unfortunate ladies, it is added, is a branch of a noble Irish family. She has arrived in Paris to prosecute and the French government, very much to its honour conducts the prosecution entirely at its own expense. General Sarrazin stood in the pillory at Paris, on Monday, he was so refractory that he had to be tied hand and foot and carried to the place of exposure. Hutchinson, Georgiana Maria, otherwise and for some time called Georgiana Maria Sarrazin, as the supposed wife of General Sarrazin (sued as and lately called or known by the name of Georgiana Hutchinson), formerly of East-Lane, Walworth, Surrey, then of Paris, France, then of St. Hellier, in the Island of Jersey, then of Judd-Street, Brunswick-Square, both in Middlesex, then of Clare-Cottage, Water-Lane, Brixton, then of Queen's Row, Walworth, both in Surrey, and late of Highgate-Hill, Middlesex, Schoolmistress. On the 30th June 1828 Georgiana Maria Sarrazin of High Wycombe Bucks wrote her will leaving everything (whatever that may have been at that stage) to her only child Frances Mary Emily; a codicil mentions Mary Fosse, the witnesses to the will being Mary Fosse and Amy Albertina Hutchinson. The same day she died of measles and was reported in the newspaper as being the youngest daughter of the late Capt Samuel Hutchinson of the Horse Guards and Deputy Consul at the Brille in Holland. Sarrazin was sentenced to twenty years hard labour, pardoned three years later and he took refuge in Lisbon. After this he was reputed to be leading a sad and transient life in Holland, England, Turkey and Germany. In May of 1825 Sarrazin received a letter from his estranged son Frederic informing him that his mother, Cecilia had died on the 7th April 1820 and that as her son he had been left 60,000 Swiss Francs and a home in Chur, Switzerland. Frederic was at that time a lieutenant in the 5th Prussian infantry regiment. Sarrazin despised the army of the King of Prussia and recommended that his son join him in London and to bring with him all the money his mother had left him notwithstanding that he previously denied to everyone that he actually had a son! By the end of July Sarrazin had a change of heart and advised Frederic not to come to London as the English did not like foreigners in their army and that he had lied about the Prussian army. Still obsessed with money, in November 1838 he stated that in a letter that he was still owed arrears of pay as General from August 1798 amounting to some one million Swiss Francs; plus 76,000 French Francs as commander of the Legion of Honour from January 1810; plus silver seized by the Minister of Police in August 1810 – 40,000 French Francs; monies from books he published had published in England and France amounting to 10,000 French Francs; damages caused by judges and jurors in Paris for false imprisonment between the 8th October 1818 and the 9th of October four million French Francs; making a total exceeding five million Francs. In March of 1834 the elder sister of his second wife Georgiana visited Sarrazin in Chelsea and asked him to make a pension for his daughter, Frances. There are no clues as to whether he complied with this; however, given everything we know of him, it seems highly unlikely! Exactly where he died still remains an unsolved mystery at present, but it was on the 11th November 1848, aged 78, somewhere in Brussels but it seems likely that very few would have grieved his passing. Sarah and Jo are genealogists and history detectives who love nothing more than unearthing little or unknown facts about people and filling in the gaps in their lives. They have now ventured into the exciting world of writing and are working on four books plus our blog. Their stories are factual, the first being the story of a Georgian lady who was abducted and raped during her teenage years, was in prison in France during the French Revolution and who went on to become a spy for the British government. The second tells the story of the well known courtesan Grace Eliot née Dalrymple in a totally new way; they have some exciting new information on her that they can't wait to share. The next two books interlink with Grace's story. This post copyright © Sarah Murden and Jo Major Elliot, 2014. Somewhat of a real-life harry Flashman! This is a wonderful post - many thanks for alerting me to suhc a fascinating character. He's the sort of character that you just wouldn't believe if he were fictional! The truth is always more interesting than fiction. And this is one of the best!